You probably already have heard that cats sense spirits from at least one person. To say something like that, some pieces of evidence would be necessary. Got scared? 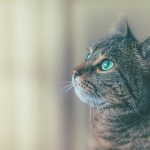 In this article, find out if it is true that cats sense spirits. Is it true that cats sense spirits? First, we need to clarify what cats represent in the mystic world. Cats are wonderful animals that truly have something special. What is special about them is that we can face them as wizards or mediums because, in a certain way, they really are. People usually say that cats sense spirits because of their vision that go beyond what we can imagine. If humans are able to see 50% of what exists in this world, cats see in totality. If you ever looked into their eyes with attention, you probably saw some kind of intelligence, as if they were on a different level of consciousness comparing to us. For the most sensitive and observers, it is easy to notice that. So much so that from ancient times, witches and wizards chose cats to be their companions. Ever since, these people believed that cats had mystical characteristics and could help gain psychic visions. The Celts even used to say that cats not only saw spirits, but were reincarnations of relatives who had already passed away. They would come close to us to advise and protect us from the evil spirits that circulated on Earth. There is something that some scholars are dedicated to studying, the animal psi. Animal psi is the psychic ability that some animals would have to see the dead, sense the future and be able to travel miles even without knowing the way. In addition to these capabilities, animal psi also studies the sensitivity of animals to us. The way they talk telepathically to humans and sense when their owners are coming home are also part of the package. Although some people do not believe that animals have souls, many others believe otherwise. They say that not only they do but have a paranormal component, just like humans. Ok, cats sense spirits but what do they do about it? Many people compare cats to dogs. They say dogs represent joy and positive energy, while cats are more mysterious and towards the dark side. They even say that cats offer no protection when compared to dogs. But they are very deceived! Nature is perfect and everything exists with a purpose. If dogs can represent a greater physical security, like the one for the house, for example, cats help us in a more subtle way. Mystics claim that cats are more capable of coming into contact with negative energies, but instead of absorbing them as some think, they transmute them. That’s right, cats find these bad energies and turn them into good ones. Have you noticed that cats are sitting or lying on a few specific places over a long period of time? This probably means that they have bumped into something that might deregulate the balance of the house and are working to purify it again. In conclusion, we not only believe that cats sense spirits, as they are able to fight them. So if you still do not see these animals with the love and respect you need, it is time to think again.